Gil Ayala loved to mix Custom Paint Colors, he loved to experiment with toners, with different base coats, to create the ultimate Custom Paint finish. 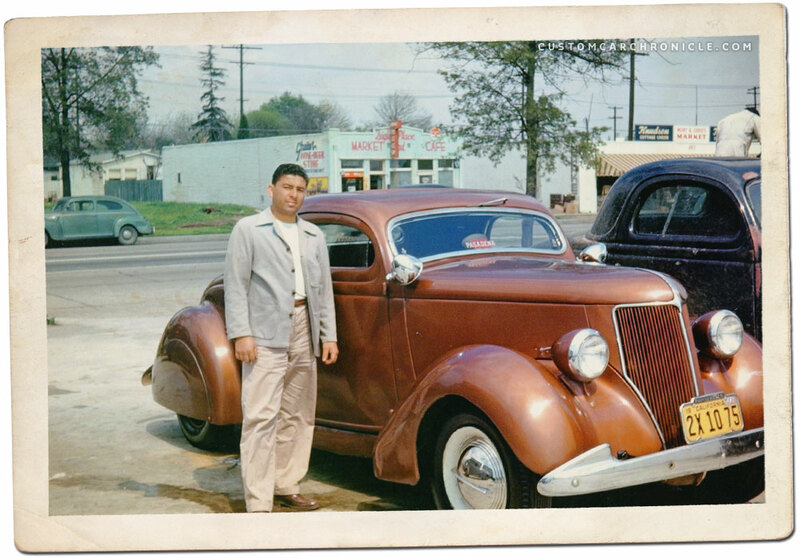 In 1945 Gil and two year older brother Al Ayala opened Gil’s Auto Body Shop on Olympic Blvd in East Los Angeles. The team would soon start to turn out trend setting and stunning looking Custom Cars with an unique look The Ayala look. Two key elements for the shop were flawless body work by Al, and stunning colors and super glossy paintwork by Gil. Gil love to mix colors, experiment with toners, and metallic powders, to come up with new and exiting custom colors. He experimented a lot with the so called bleeding colors, that were rather transparent, and the more coats you added of these, the deeper the color became. The color base coat also influenced the hue, so more experimenting was needed to find the perfect mix. From the early period, the first 5-7 years there have so far not been any color photos shared that show what Gil was doing. But there stories are there, the black and white magazine features are there, withe the color descriptions. and fortunately we have several magazine covers from the early-mid 1950’s that show the Gil Ayala Custom Colors. And even better, and for sure more accurate several great color photos showing Gil’s work have survived all these years and have been shared with the Custom Car enthusiasts. And hopefully the future will bring many more. 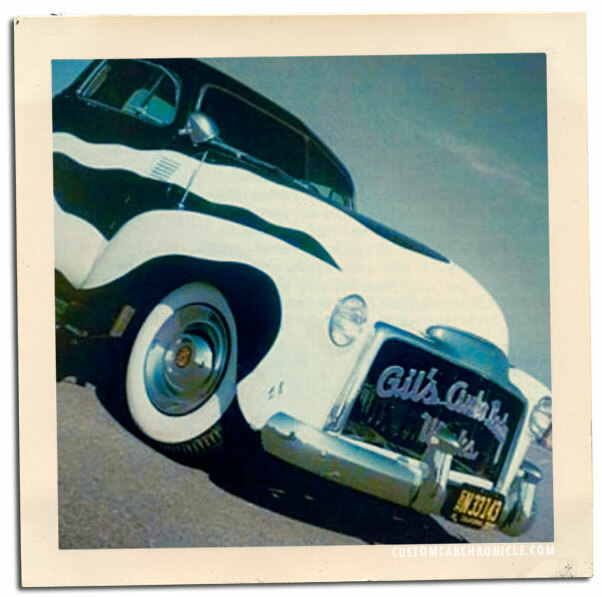 Gil was widely known for mixing Custom Colors, and painting cars. People from all over SoCal came to Gil to have him mix special paints. $15 to $25 was all it took to have Gil mix you one or two gallon of special mixed paint. You could then take it home to spray yourself, or have another painted do it for you. Having Gil paint your car would of course cost you. He was after all one of the best. Especially later on, in the later part of the 1950’s up into the 1970’s Gil painted many cars, for customers who just wanted to have a special unique color on their car. Not necessarily a custom car or hot rod. He always extra promoted the Custom Painting on the ads he ran for his Gil’s Auto Body Shop as well as the business cards he had. 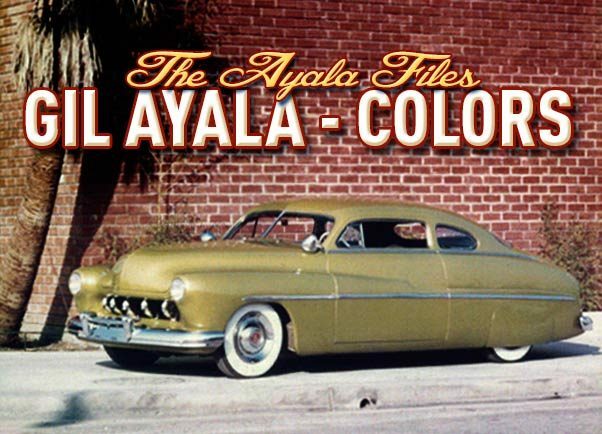 One of the most amazing color photos taken of Ayala Customs must be the one taken for the Cover of the Oct. ’51 Motor Trend magazine. It shows no less than four Gil Ayala painted custom cars in one picture. The cars are. Top left, Don Holland’s Dark purple painted 41 Ford convertible, Top right, Wally Welch’s Devil-Red metallic painted ’41 Ford convertible. Middle right, John Geraghty’s Glamour Green ’40 Ford convertible, and lower left is Gil’s personal ’42-46 Ford Coupe painted in his favorite bronze metallic color. One of the first full Custom Cars Gil Ayala created for himself is his ’42-46 Ford long door coupe with ultra slippery chopped top and smooth moulded fenders. He painted the car in his own mix of bronze, copper, gold. We don’t know if he named this color, and the only time we have found it listed in any of the period publications it was named Gold. But the color photos we have seen of the car show a more bronze than gold looking paint. Apparently Gil liked this color, or the copper hue very much, since he used it on at least two more car. Of course it could also be that the client had seen Gil’s Ford and decided they wanted their cars painted a similar color. Possibly Gil painted or mixed this color for the first time for Lynn Yakel’s 1936 Ford chopped coupe which was restyled at Gil’s Auto Body Works. 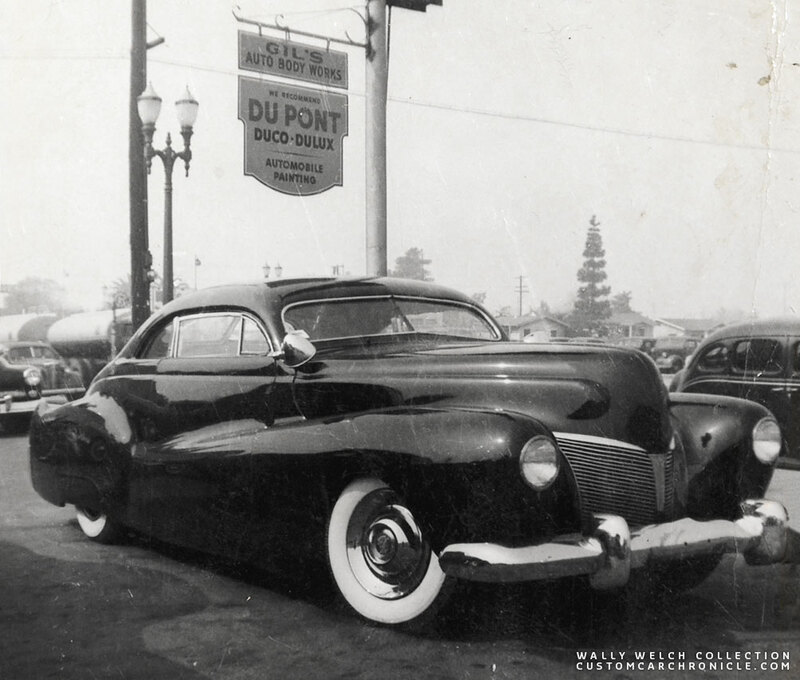 Lynn Yakel’s 1936 Ford was restyled by the Ayala’s It is unsure if Gil actually painted the car himself, or that a guy named Rudy who was working for Johnny’s Body & Fender shop located next door to the Ayala’s painted it. But the color used on Lynn’s Ford was the same color that was used on Gil’s personal ’42Ford. So at least Gil had custom mixed the color for Lynn’s Ford. We have only found one period publication that lists the color of Gil’s personal ’42 Ford… as Gold. We now know that is was a bronze metallic color custom mixed by Gil. Later the car was painted deep blue, but from version that we have sadly not been able to find any color photos. Who knows what the future will bring. 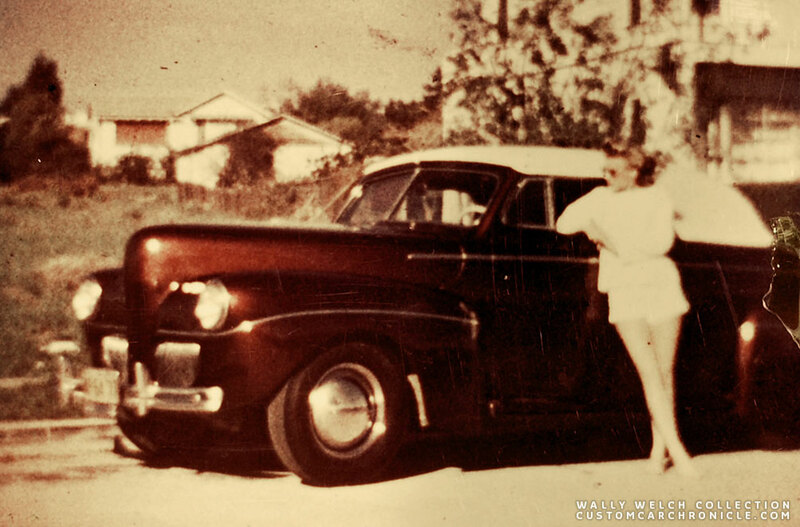 Gil’s 42-46 Ford coupe, most likely owned by Bob Gillum at the time this amazing color photo was taken. Unidentified 41 Ford chopped convertible at the Ayala shop is also painted in a bronze hue. Most likely painted by Gil. 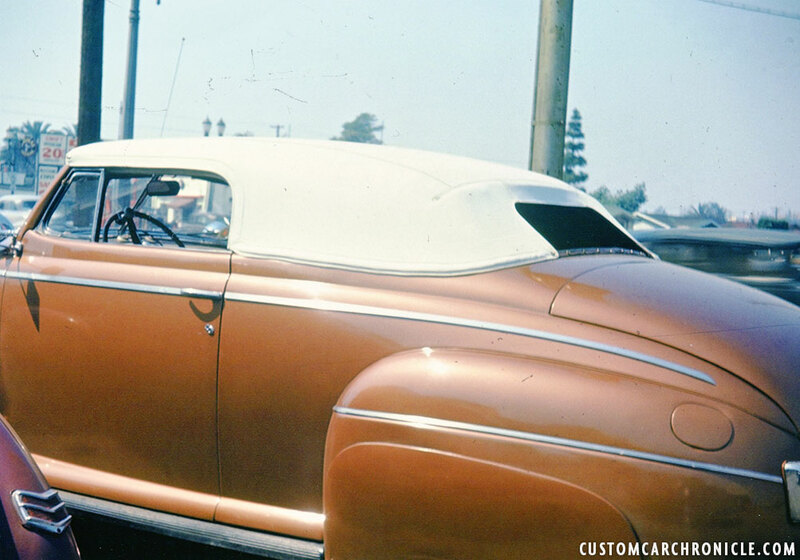 These bronze hue paints appear to have been very popular on Custom Cars in the late 1940’s early 1950’s. We have found quite a few cars that were painted in this color range, and not only done by Gil Ayala. One of the early popular Gil Ayala colors was Devil-Red and Devil-Red Maroon. We know of several cars painted in a dark, deep red color that has been named Devil-Red Wally Welch had his ’41 Ford painted this color twice, and Gil also used this color when he repainted his own personal 1940 Mercury Coupe with full fade away fenders from yet black to Devil Red. 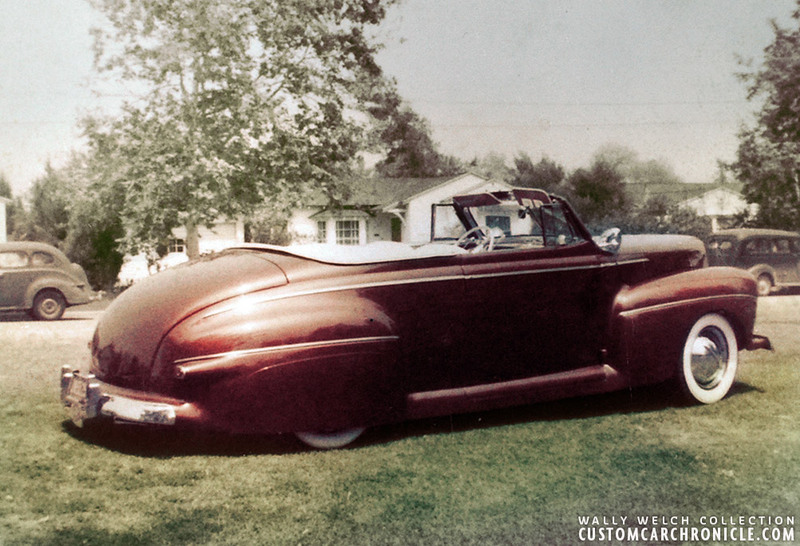 Early version of Wally Welsh’s ’41 Ford shows a deep dark red color. 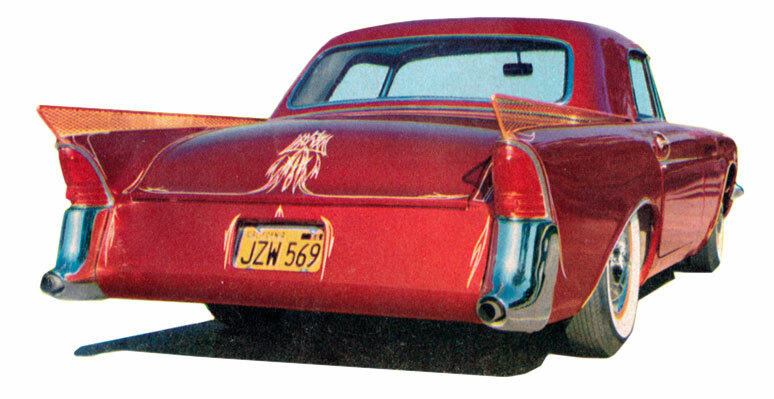 This version of the car also had the deep red, devil-red paint mixed and applied by Gil Ayala. The Devil-Red Metallic color of Wally’s ’41 Ford shows even better in the color slide that was made at the gathering of Ayala Restyled cars at the Gi’s Auto Body Works shop for the famous Motor Trend cover. 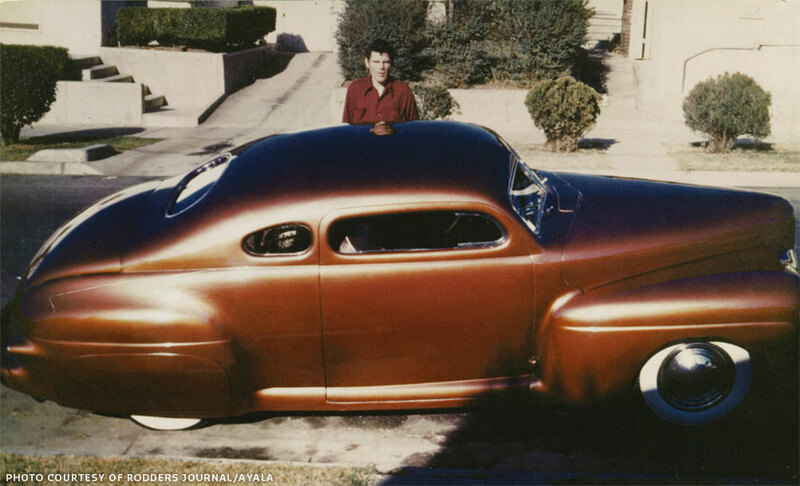 The full fade away fender 1940 Mercury was created as Gil’s personal car, but was later sold to Richard J. Stickley. 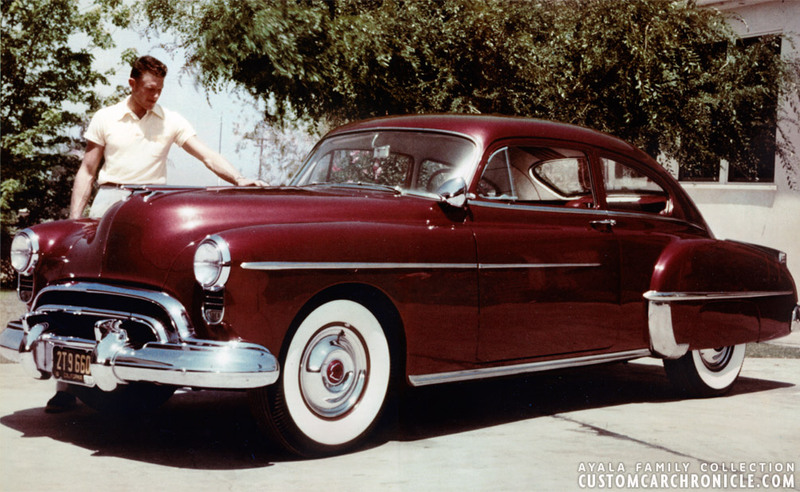 It was painted yet black at first, but when Richards owned it in 1951 Gil had repainted the car in Devil Maroon. No color photos have been surfaced of either version so far. But since Gil’s wife Lucille mentioned in one of her written notes that the car was painted Devil Maroon, I wanted to include it in this article on Gil’s Colors anyway. 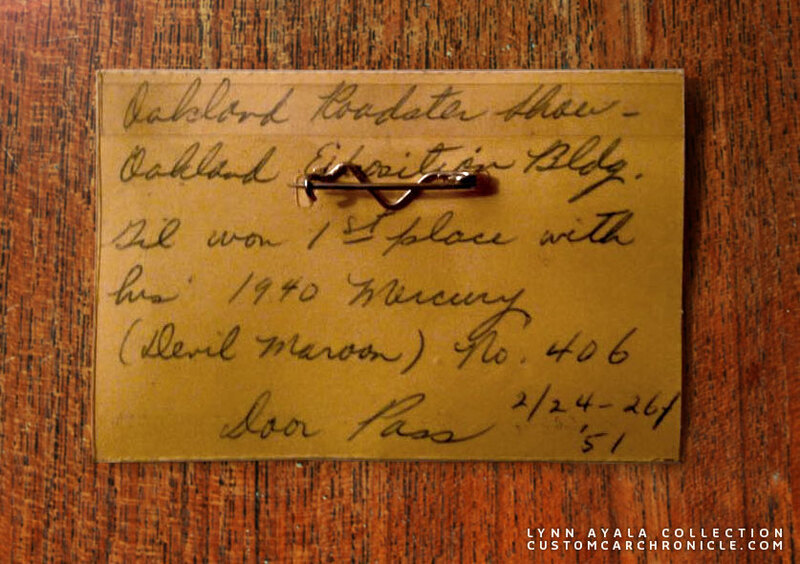 This is the note that Gil’s wife Lucille wrote on the back of the 1951 Oakland Roadster Show contender pin. 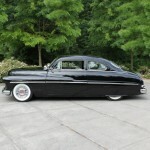 There she mentioned that Gil’s ’40 Mercury had one 1st place and that the car was (Devil Maroon). The Ayala’s mildy restyled Mel Gerrard’s ’50 Oldsmobile before Gil added the beautiful custom mixed deep maroon lauqer paint to it. Stunning color photo from the Ayala Family. 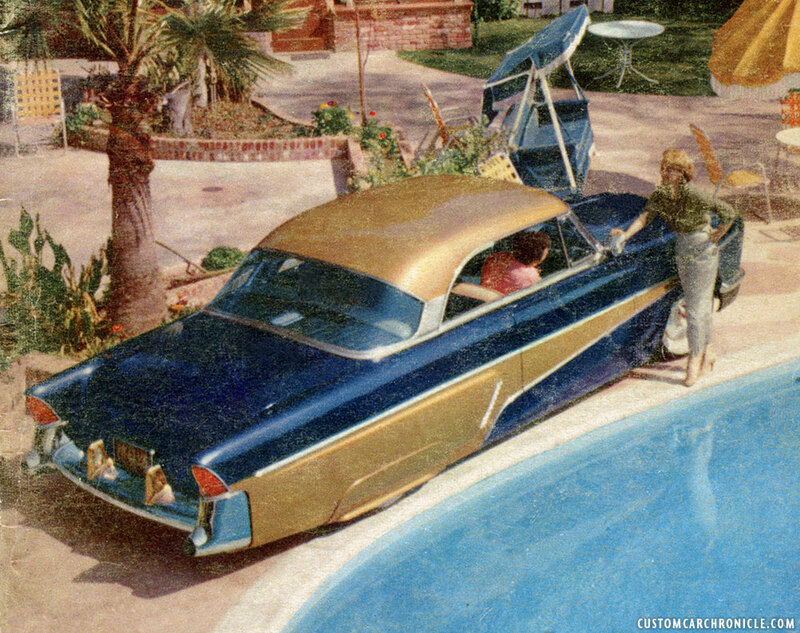 The paint Gil Ayala added to Mel Gerrard’s ’50 Oldsmobile “88” was beautifully described in the Trend book 1955 Custom Cars Annual. 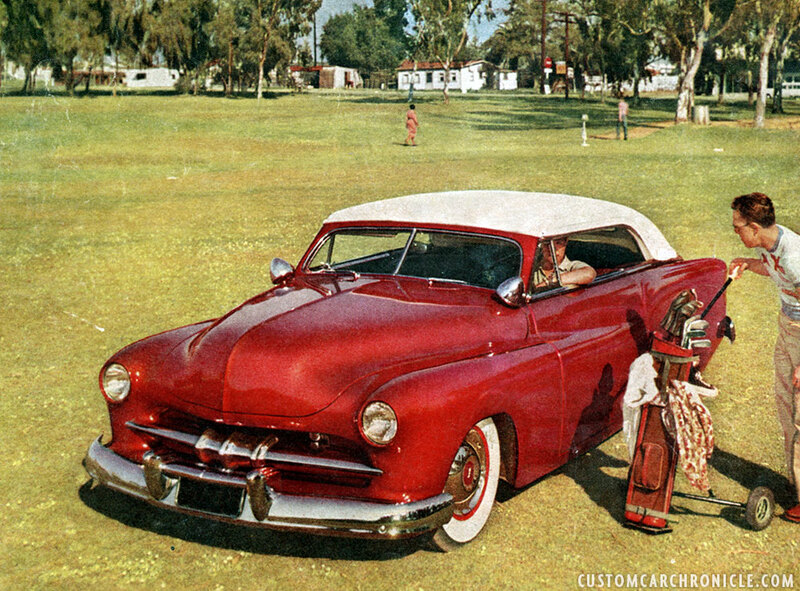 Al Glickman’s ’49 Mercury convertible was painted Devil-Red Maroon as well. 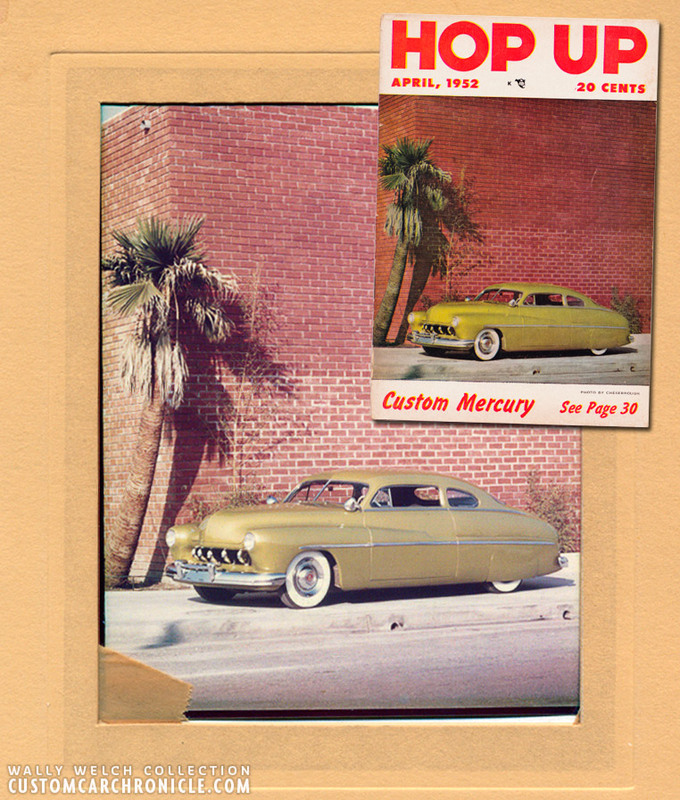 Thanks to the May 1953 Hop Up magazine cover image we know a bit how this color looked on the Mercury. The printing techniques back in 1953 were not as great and accurate as we are used to now, so we have to keep in mind the colors might be a bit off from how they really looked. One of the most popular typical Gil Ayala Custom Colors must be the lime gold used on the Wally Welch and Louis Bettancourt Mercury’s. Gil Ayala first painted Wally’s merc an brilliant lime green with gold powder added for extra sparkle. 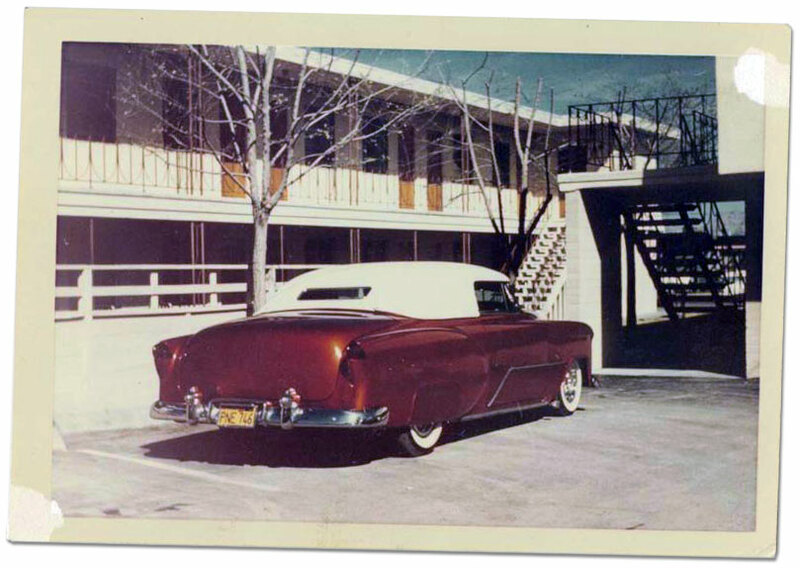 The car looked absolutely stunning in this color and it must have sets Wally’s Mercury apart from most other customs back in the early 1950’s. A lot of Custom Cars were painted with dark organic paints, so the Lime Gold must have been very refreshing. And when Wally’s Mercury was at its debut show, the Petersen Motorama in 1951 it must have caused quite a stir with the public. And it might very well be possible that the judges were very impressed with Gil’s brilliant color and his bold choice of painting a large, almost brand new car, with such a “In Your Face” kind of color as well. 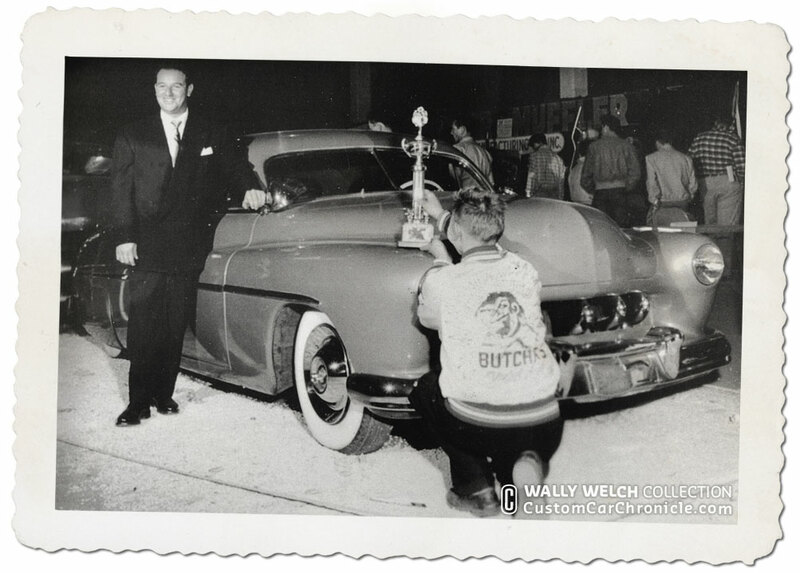 In any event Wally did win the Best Custom award at the 1951 Pan Pacific Petersen’s Autorama show. 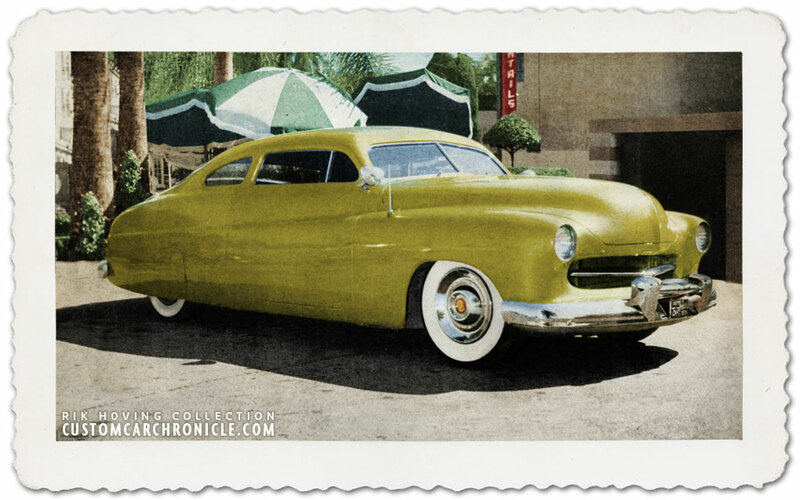 Several people also mentioned that the Ayala’s were trying to debut two Mercury’s at this 1951 Peterson Motorama show, and both were to be painted a shade of lime gold. The Wally Welch Merc was finished in time for the show, but the other one, the 1949 Mercury the shop was creating for Louis Bettancourt, had a lot more body work going on, and could not be finished in time for the show. It must have been a stunning experience to see two of these amazing smooth Custom Cars both painted and brilliant lime gold sitting side by side. Sadly that never happened. Louis 1949 Mercury was eventually finished a year later and debuted at the 1952 Petersen Motorama Show. Both cars were later (not even to long after being finished) repainted at the Barris shop. Wally’s Merc became dark purple, and Louis Mercury was painted a deep Tingia Maroon by George Barris. For those who want to have more info on the Ayala lime Gold colors, there is a very informative and interesting discussion going on about this color on the CCC-FORUM. Wally Welch’s 1950 Mercury was painted Lime Gold by Gil when it was first done. It appeared like that in color on the cover of the April, 1952 issue of Hop Up magazine. The bright color of the car made a huge impact on many readers. The large photo shows the original color slide with the magazine cover as inset. The slide has faded, and the cover colors might have been enhanced by the printing methods used. When Justin Mozart had the car restored they found the original paint applied by Gil Ayala in 1951-52 on the door jambs. It also showed that the Lime Gold was applied over a dark red base, so it must have been a very solid color. 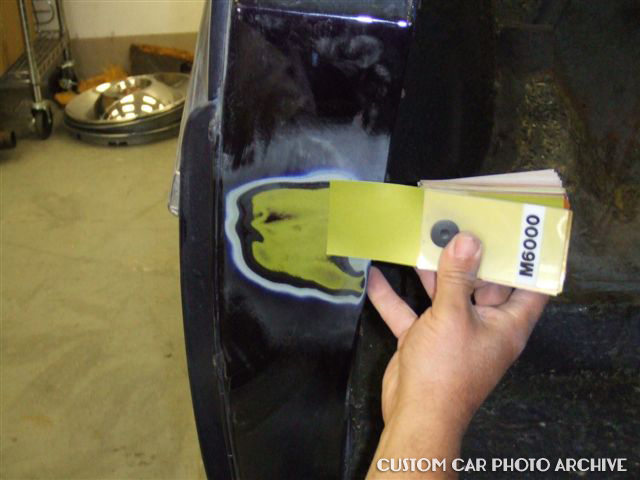 Later the car was repainted at the Barris Shop, deep purple over a dark gray primer base. It looks like another dark coat was added after that before the car was repainted by Joe Eddy with an off white and white base followed by dark purple. Trying to color match Gil’s original paint. Gil won the big price at the 1951 Peterson Motorama held at the Pan Pacific Auditorium in Los Angles. One of the key factors in winning the award might have been Gil’s unique Lime Gold color. Louis Bettancourt Mercury was painted Scintillating Green Gold by Gil. So far no actual color photo of this version of Louis Mercury has surface, so we have to do with one I digitally colorized to what I feel the original color might have looked like. 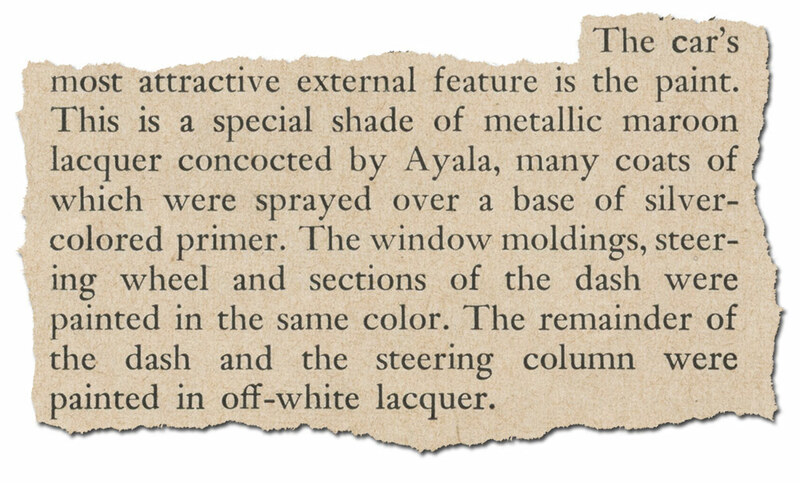 This is how Gil’s custom mixed color on Louis Bettancourt’s ’49 Mercury was described in the April 1953 issue of Popular Mechanics. The car was featured in that magazine as part of an article titled Four Wheels Waiting for a Face Lifting. 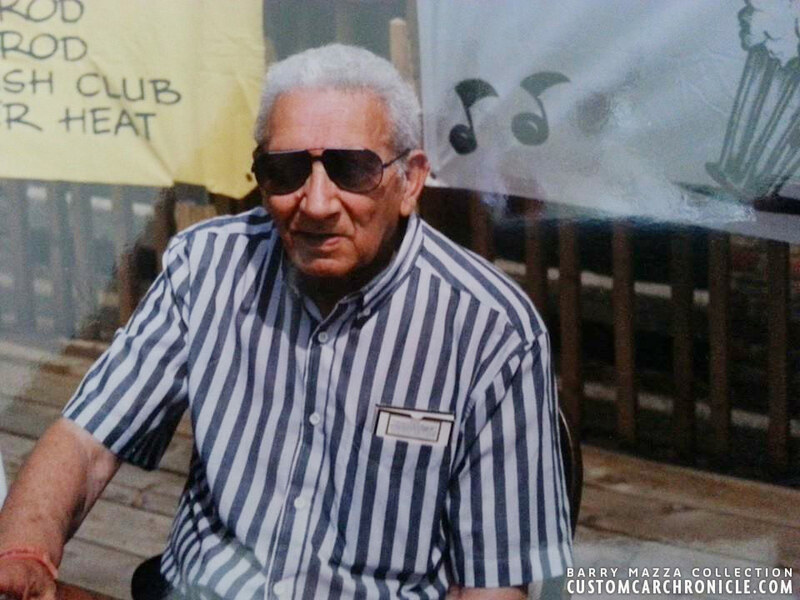 Gil Ayala mixed many custom colors and painted many cars in his long career at his Gil’s Auto Body Works. Later one or two other guys started to paint cars at the shop, but especially in the early years all the paint work was done by Gil. Memo Ortega remembered that Gil always talked about mixing colors and how much he loved it. 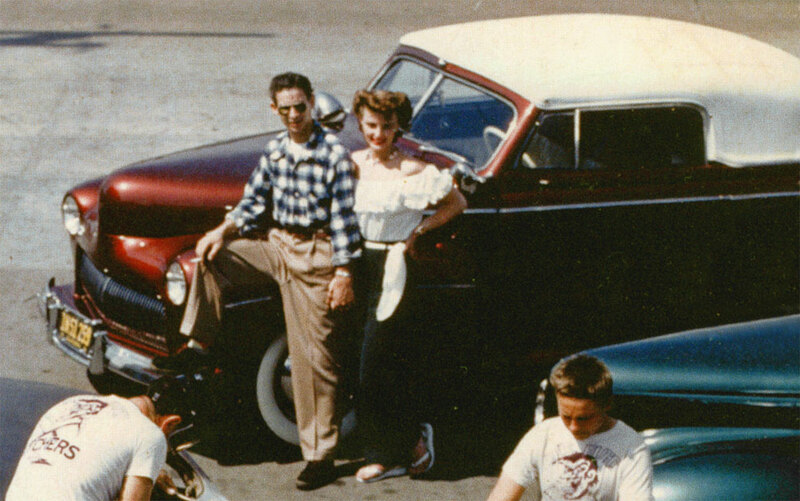 When it came time to have his own 1953 Chevy, which was partly restyled at the Ayala shop, painted Memo asked Gil to custom mix him a color. Memo had plans to paint the car himself, together with Matt Kolbert, his boss at the body shop he worked at back then. But he wanted an unique color and knew Gil loved to mix paint. Gil mixed Memo one and a halve gallon of the special honey maroon color, just the right color Memo wanted. The House of Chrome shop truck was restyled by the Ayala’s and Gil Ayala painted it a kind of home made Candy Purple. 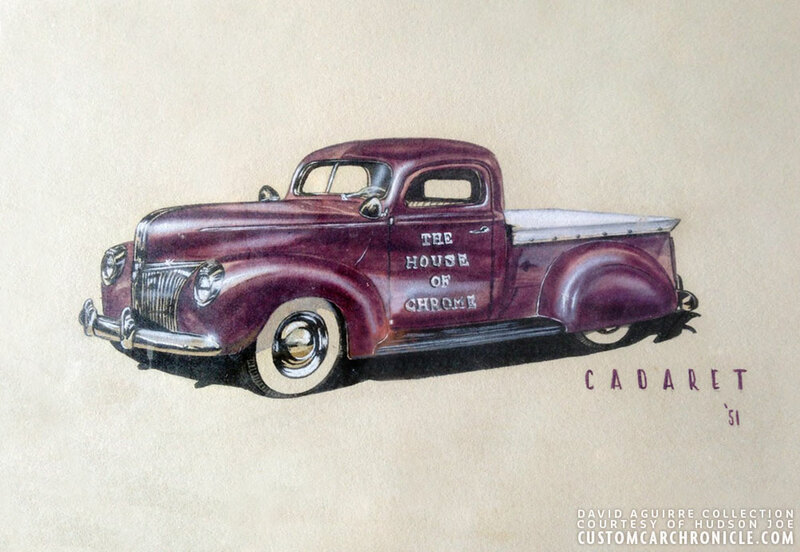 Sadly we do not have a color photo of this truck to show, but we do have a picture of a painting that was done in 1951 by GM concept artist Robert A. Cadaret who was working with Gil Ayala at the time. 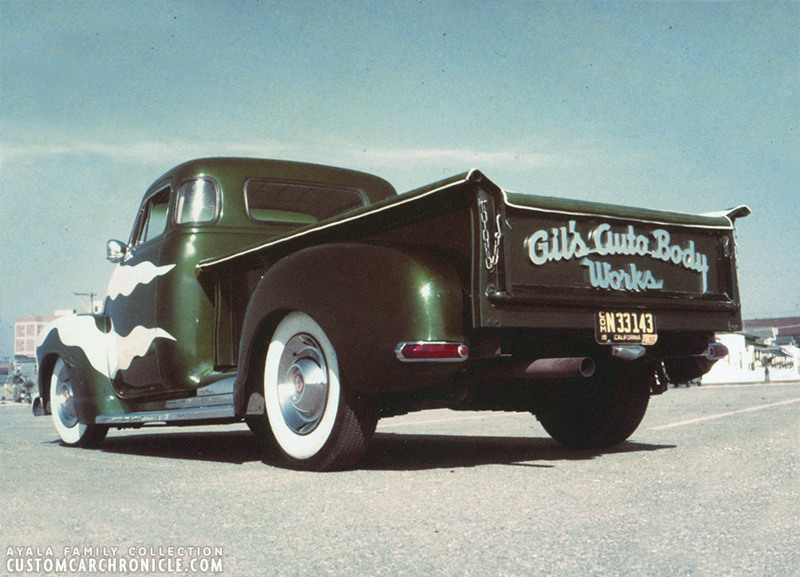 Gil Ayala painted John Geragthy’s 1940 Ford with a brilliant irridecent green lacquer. Gil used about 30 coats of an emerald green lacquer over an silver base coat. He named it the color “Glamour Green”. 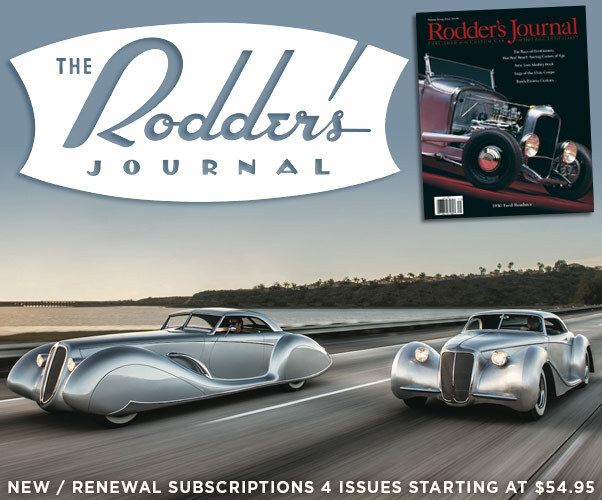 Johnny Rosier’s 53 Mercury was painted a deep Blue with Gold. which was described as Golden Metallic Black with green gold in the cars feature article in the May 1956 issue of Rod & Custom. This photo of the car appeared on the cover. 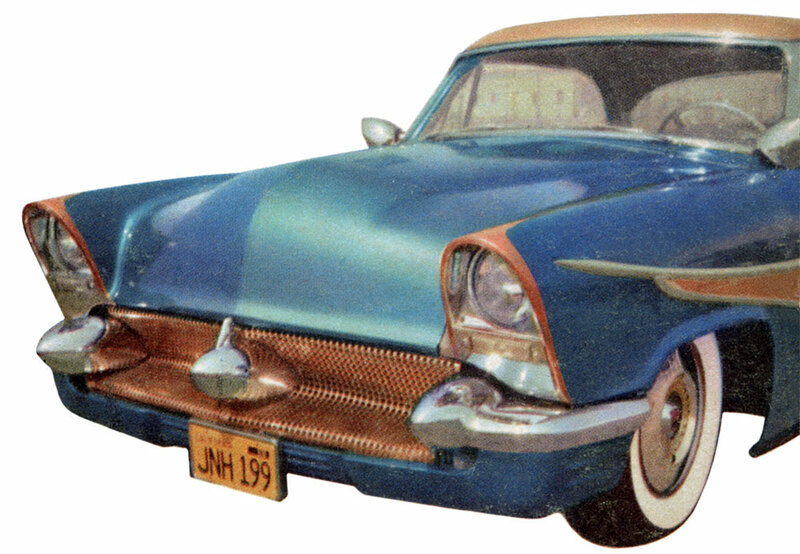 On the cover of the Car Craft March 1958 issue Johnny’s Mercury appears to have been repainted in a aqua blue with copper/gold. 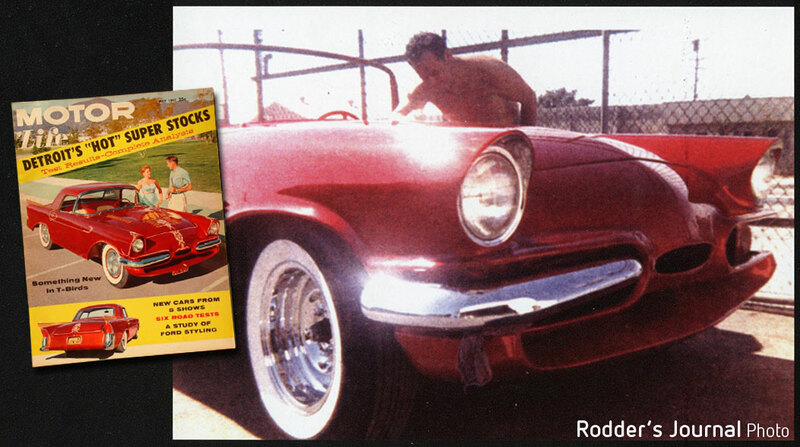 Bob Lomax’s ’53 Chevy was painted in a custom mixed Matador red by Gil around 1956. A few years later the car was redone in Candy Apple Red, most likely painted by Gil Ayala as well. We have heard from several sources that Gil did not only paint cars, but also bikes. The bikes of the kids from the neighbourhood, or kids that came over to the shop watching the guys at work, creating Custom Car Magic. When Gil had some paint left overs from a car paint-job he would do a bike, just for fun. Can you imagine if one of the Gil Ayala painted bikes would emerge from an East Los Angles home garage. Very few original Ayala Customs have surfaced so far. But we have been very fortunate that Gil’s Personal 1955 Thunderbird the Wild Bird has been saved and was recently restored by Yaril Quintana’s Florida based shop for Norwegian owner Bjørn Inge Jansson. During the full frame off restoration Yaril found a small spot that had never before ground down to bare metal and hold every coat of paint that was ever added to the car, including the original factory color, but of course much more important all the colors Gil Ayala sprayed on his own personal car. 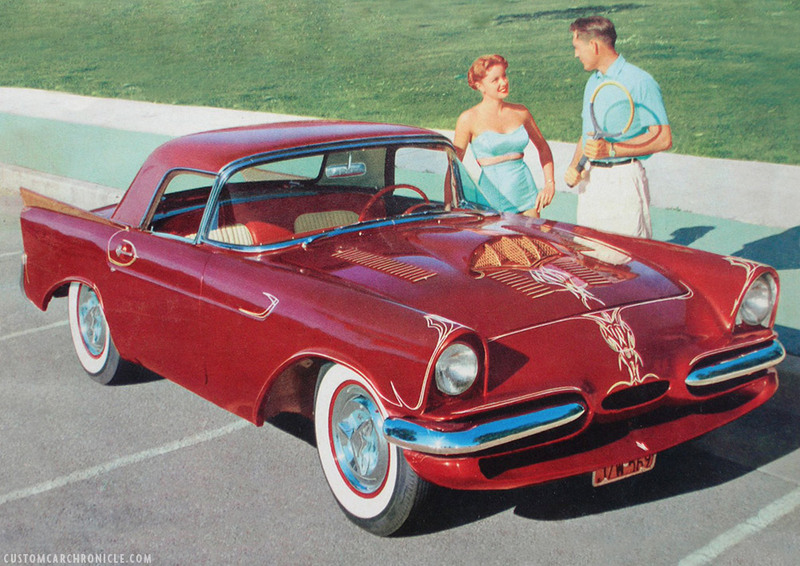 1957 Motor Life magazine showed two color photos of Gil’s Wild Bird in the second custom color solid dark red. In the early 1960’s Gil redid the Wild Bird with new headlights, a new smoothed hood. For the new version Gil repainted the car in Candy Apple Red. 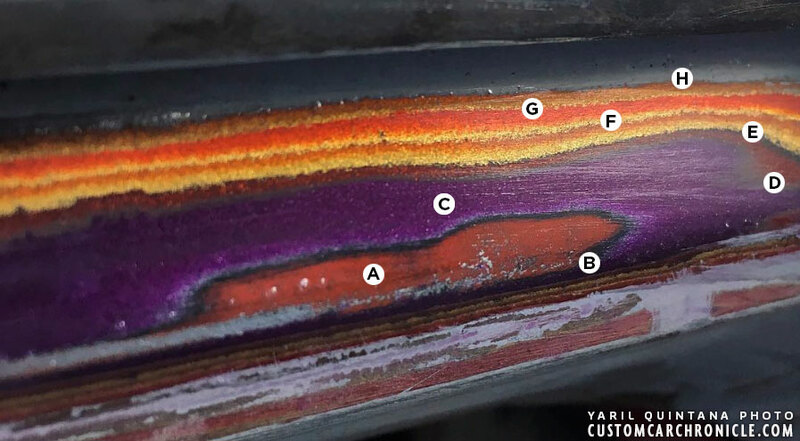 During the 2017 restoration of the car Yaril Quintana found a spot on the base of the windshield frame that still had all the previous layers of paint on it. After careful sanding all the coats, including the original Torch Red from the factory. Colors on Gil Ayala’s Wild Bird over the years. A – Original Torch Red factory color. D – Second Custom mixed color was dark Red. 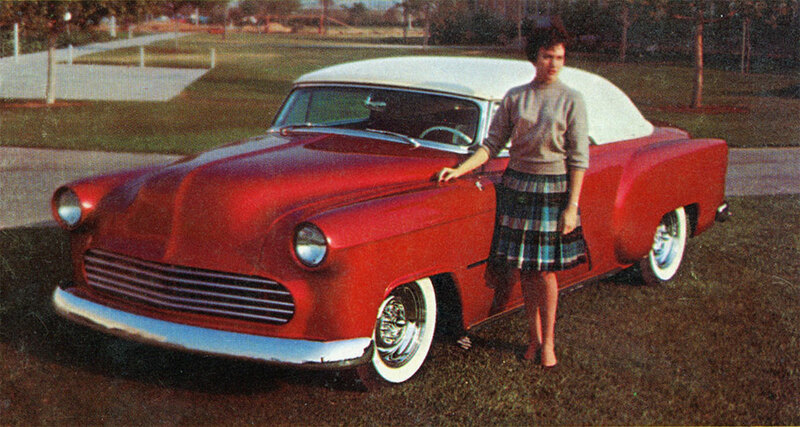 This was the color the car had on the 1957 Motor Life magazine cover photo shown above. The color was painted over a dark gray primer/base coat. E – After the dark red came a first Candy red color that was sprayed over a black base followed by gold. This Candy red looks to be less bright as the later one. Perhaps Gil was experimenting with colors. F – Later a new series of dark base followed by bright gold and a now much more brilliant Candy Red was applied by Gil. G – It looks like after the bright Candy red another gold base followed by a Candy Red which looks to be darker than the previous was applied. H – Shows several primer coats from previous owners preventing the body from deteriorating. 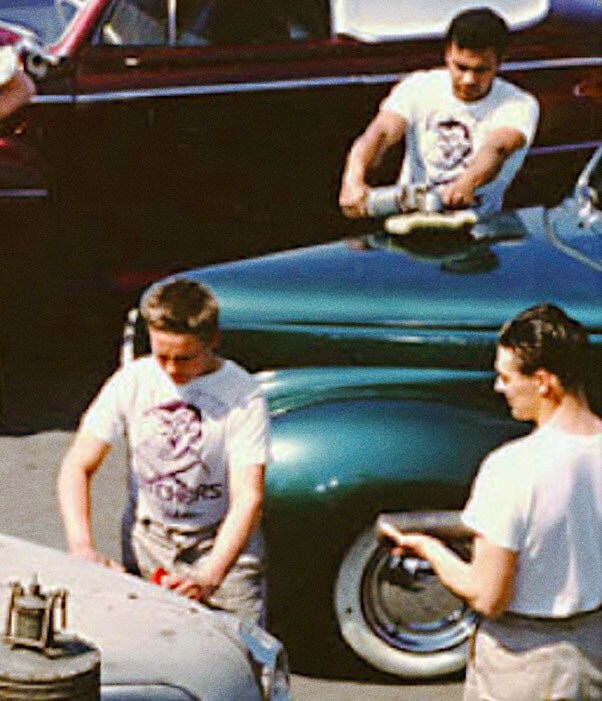 A very rare photo of Gil Ayala actually painting a car. 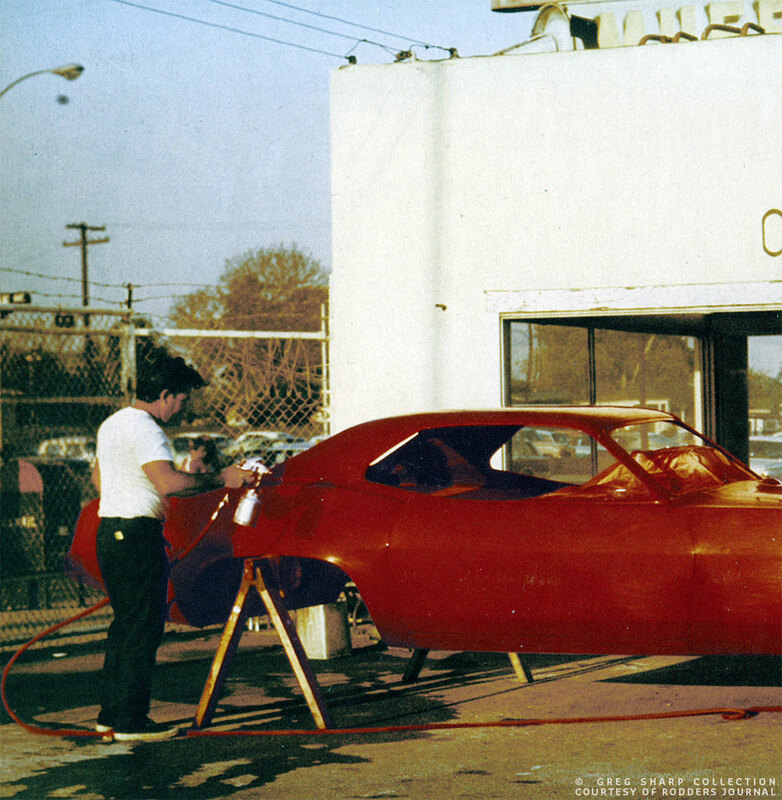 In this Greg Sharp Collection photo we can see Gil painting Big John Mazmanian ’70 Cuda Funny Car in Candy Red, outside in front of what used to the the House of Chrome in the early 1950’s. Gil Ayala, photo by Barry Mazza. The Custom painted cars in this article must be only the very top of the iceberg when it comes to Gil Ayala painted cars. 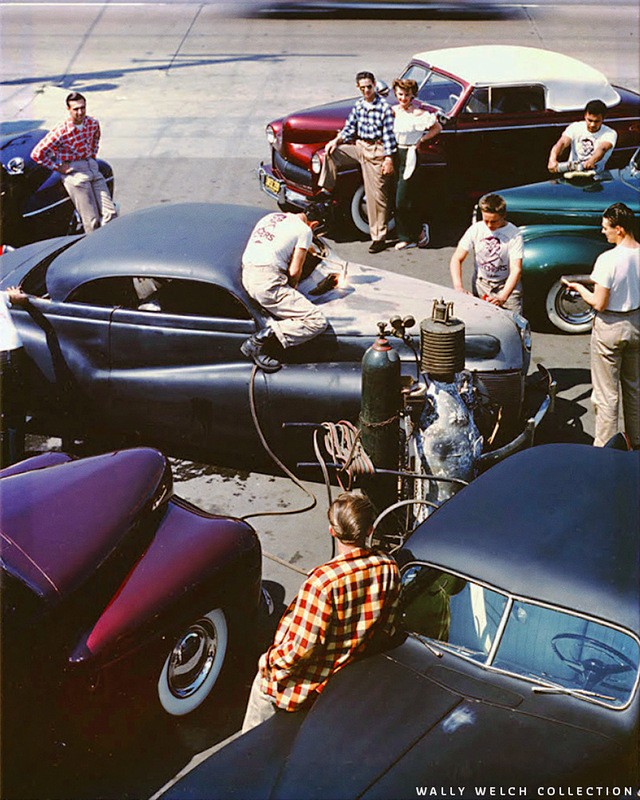 We all have heard the stories of Gil painting so many cars, and there must be some more color photos out there. And hopefully some of those will surface sooner or later. 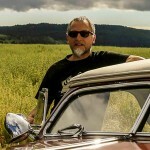 It would be really great to add them to this article, or perhaps in part two to honour Gil’s passion for mixing Custom Colors, and painting custom cars, regular cars and bikes. 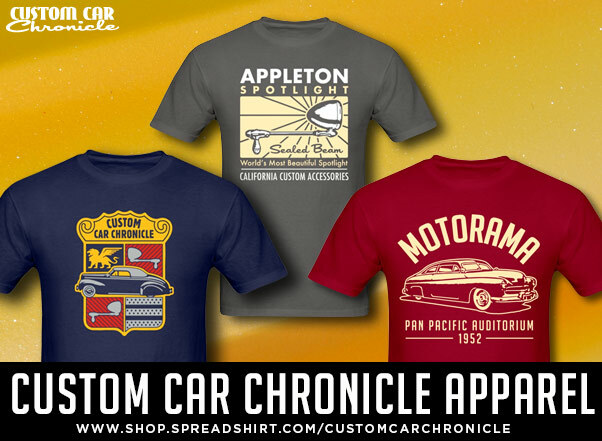 So if any of our readers has any more info, or more photos showing the Custom Colors of Gil Ayala, please send Rik Hoving an email, so we can share it with the Custom Car World and all the Custom Car Chronicle readers. 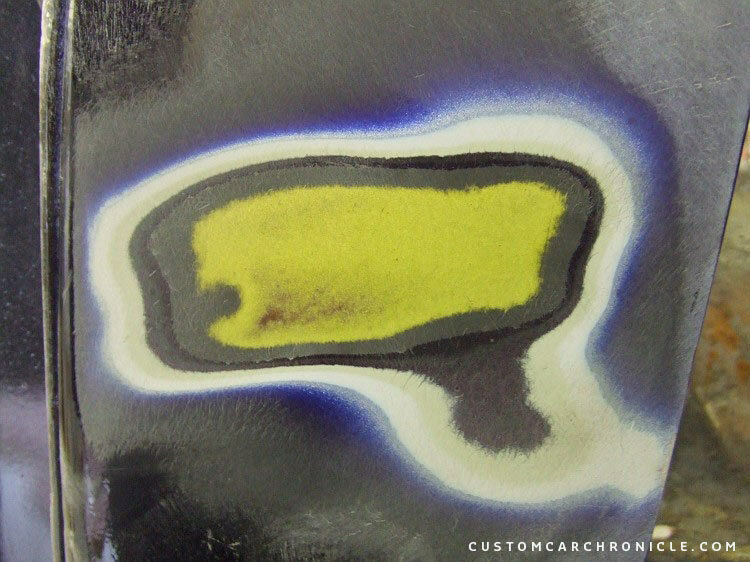 Great research on the outstanding colors that Gil Ayala mixed to paint his custom creations. These cars always looked so good in color on the covers of the period car magazines. I bet that his custom paint jobs really stood out when they were done back then! What would the customs of the 50s be, without colors as scintillating, deep, and brilliant? Seeing them finally on the CCC brings back all the imaginings of teens in the hinterlands, with each monthly issue of the “little pages”. The realities you are revealing, Rik, makes that “California dreaming”, finally, REAL! Good article Rik. It really is a shame more colour pictures are not around of Gil’s work. Love reading this. Great article Rik.